The more ways you offer prospective customers to contact you and join your automatic follow-up system, the more money you’re going to make. So why restrict the way people contact you? Not everyone wants your e-newsletters. If people know and trust you, some prefer to see short text messages. Others want to call a phone number. If you’re already doing something to capture leads for your business, great job. You’d be surprised how many small businesses are leaving business on the table. If you’re a small business capturing leads with only one type of media or channel, you’re missing out on three to 10 times more prospects than you’re currently getting. It’s pretty simple math – when you double the number of leads you capture, automatically follow up and sell to them with a system, you’re going to double your revenue. Take a look at the graph below that describes how an online marketing approach might help you find new customers to benefit your small business. Here’s seven different ways to save prospecting time in your day. business card scanner with mobile app for iphones. Up your game – give your prospects more ways to contact you. 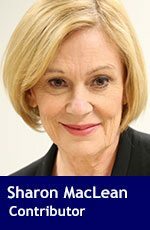 Life-long communications strategist Sharon MacLean owned and published a traditional print magazine for business people for over 21 years. She now applies her enhanced knowledge in digital marketing to the needs of her clients and believes in the value of combining the best of both worlds.